For the last several weeks I have been in a discussion, on various blog-posts and a public forum here in my area about a story, a way of thinking and living. It has been stimulating and enlightening to hear and read various testimonies from others. I want to share a satire of it and get your thoughts. What if all forms of authority in your life — law-enforcement, government, parents, utility companies, military — told you that you must return to and use 18th, 17th, and 16th century personal, household, and public items and products? You can no longer use modern items in your daily life. No more cell phone, no more automobile or anything other than two-wheeled equipment, no more electricity, no more GPS, no more vaccinations or modern over-the-counter medicine, no more tapes or glues, no more television, no more contraceptives, no more modern kitchen appliances. If you try, you will be imprisoned for a minimum of 20-years; repeat offenders 40-years or suicide. Imagine, seriously imagine having to do this for an indefinite period of time. How would you like it? Would you welcome the digress or would you complain and rebel? What would be the advantages of returning to a bygone era? What are the disadvantages? If you are one of the thousands or millions who do not wish to return to a time of no penicillin, no 24-hour deodorant, no contraceptives, or no indoor plumbing, then you would be quite modernistic, quite progressive, to state the obvious. Why choose that if you don’t have to? Remarkably, there are millions of people who willingly elect to return or stay firmly entrenched in an antiquated, flawed life-paradigm no matter its expired ancient condition. Time, insight, wisdom, and progress never stop. That is a universal law. It is human nature to be curious, to observe and learn, ever evolving sometimes for the worse, but frequently for better. These are empirical, ontological, epistemic truths. Yes, despite humanity’s horrific track-record at times, what is wrong with being an optimist, a realistic optimist? There are those, however, who do not want perpetual improvement. They do not want an unconditional celebration of life, this life right here and now. They teach and preach that this life and our planet is severely defective and irreparable. Enter the popular, the great Masqueraders of Sanctimonious Rescue! There is Hebaroo, then Kristop, and last Islahn. All three are brothers, so they claim, but family history has shown constant estrangement and little kindness to each other. All three blame complete strangers and the other two for all the family and world dysfunction. Each claim themself the sole heir of all this life’s riches and the next. It cannot be shared. Period. Would you like to marry one of them? If you do, each of them promise a perpetual state of war! If you don’t marry one, they’ll promise a perpetual state of more war so agonizing you’ll want to kill yourself, your children, and everyone else. Now, don’t you see from what you/we need rescuing? This is the carnival merry-go-round everyone was born onto and can never escape or stop its endless rotation. Round and round we all go. What a Stephen King nightmare, huh? Do not fret my clever friends, there are MANY ways to completely avoid this carousel, carnival, and its sanctimonious masqueraders and keep your life, joy, peace of mind, and exciting future! All three temperamental brothers have their gangs, their peeps if you will, and various codes of conduct. Since much of the Western hemisphere is the territory of Kristop I will work on him and his gang-members, though I could address Hebaroo or Islahn as well, but for the sake of your time and mine I want to stick to Kristop for now. Why Do I Need Rescuing? In the spirit of this festive tale and Kristos’ mode of operation, you must be married to him as soon as possible. Even if you are 4-years old, do not wait! You must become part of his harem. Staying “single” or unmarried, at four or ninety-four, leaves you at high-risk for all types of tragedy, for emotional, mental, and physical anguish, and because the entire Earth and all its inhabitants — except for Kristopians — are carnivorous and want to devour you whole or slowly in little pieces before invisible King Exedo arrives and finishes you off! Plus, you and all strangers have no will-power, or at least strong enough not to fall under the spell of King Exedo. One more thing, all human perceived deformities, malignate-terminal diseases, imperfections, or anything bad which is non-human are caused by and are wicked schemes of invisible King Exedo. All of these sad, painful, harmful, life-threatening problems are by King Exedo and any non-Kristopians. They are why we all need the loving rescue and marital brute “protection” of Kristop. What makes these two characters so indistinguishable is that sometimes they can be one in the same. Other times they are completely different. What is most important though is not that you fully understand Aurae and/or Hermanewt, but that you become intimate with them both no matter what they may or may not represent. To know Aurae is to also know Hermanewt and to grasp and utilize Hermanewt you must first be intimate with Aurae. Once you have mastered these two characters, you are officially a member of Kristopians with privileges. Got it? If not, I will explain all in basic terms later in this excellent Greekish-Latinish medieval genre of storytelling. But we must continue with your/humanity’s dire need for death-insurance. Despite what hundreds of soothsayers, intuits, or NDS’s (near-death survivors) consistently report, Kristop and Kristopians, Hebaroo and Hebarooans, Islahn and his Muuslinians, and thousands of other gangs… all say ambiguously and unambiguously what destination you and humanity will travel to post-mortem. There is only ONE map to this destination. Kristop and Kristopians say it is their map. Islahn and Muuslinians vehemently argue it is their map! Hebaroo and Hebarooans say no, it’s neither of those maps, it is strictly their map! These three brothers have never gotten along or agreed completely about maps, nor Aurae, Hermanewt, King Exedo, or whose masquerade carnival is most magnificent. No matter, even though there has never been anyone to go to that post-mortem destination and returned to tell about it, you and all of humanity must still have their exclusive (free of charge?) death-insurance protection and password! Got it? If not, I will explain all in basic terms later. Like all demi-god-like human characters, Kristop has a boss, the head-honcho Godhead of the Syndicate, if you will. HHG of the Syn goes by so many different names that no one really knows if the “entity” actually exists. No one can indisputably prove its existence, only orthodoxy, and circumstantial evidence or theories within our three gangs here raise the HHG-Syn’s possibility. For the sake of argument, let’s say Kristop’s boss HHG-Syn does exist. Where is HHG-Syn and how can one perceive HHG-Syn? Kristop and his code of gang-conduct proposes two means of perception: 1) Woolly disclosure and 2) Exceptional disclosure. Because of these two methods not one single human being past, present, or future could/can/will say they knew nothing of HHG-Syn and the codes of gang-conduct. Woolly disclosure, according to Kristop and Kristopians, is so obvious to everyone everywhere that if it were a snake, it would leap up and chomp on your nose! It never let’s go either. Honestly, look at all the trees on Earth. Every single tree is exactly identical; they have roots, bark, limbs, and leaves, some even have different color flowers and different shaped leaves. That reflects one HHG-Syn, and one HHG-Syn-Kristop code. That is woolly disclosure! It cannot be mistaken because everyone perceives the same. Honestly, look at all the fish in the seas and oceans. Every single fish is exactly identical; they have fins, scales, gills, and tails, some even have spots or stripes. See, that reflects one HHG-Syn, and one HHG-Syn-Kristop code. That is woolly disclosure! It cannot be mistaken because everyone perceives the same. Honestly, look at all the speaking and writing by all humanity, from beginning up to today. Every single oral story, book, language or hieroglyphs, and their plots are exactly identical; they have a table of contents, a prologue, page numbers, chapters, suspense, an epilogue, and a dramatic ending, some even have pictures. See, this too reflects one HHG-Syn, and one HHG-Syn-Kristop code. That is also woolly disclosure! You cannot mistake it because everyone perceives the same thing. Exceptional disclosure, according to Kristop and Kristopians, is the one and only singular Code of Gang-Conduct and later amendments to previous shortcomings. If the previously covered protection-plans and death-insurance policy wasn’t enough to persuade you/humanity, and Woolly disclosure is not pristine to the unambiguous ambiguity of HHG-Syn, then don’t be afraid, one and only one singular, timeless Code of Gang-Conduct (with amendments) has been given to you and all of humanity to aid in rescue! There is absolutely no ambiguity present in the Code of Gang-Conduct (with amendments) if you simply wear Aurae-Hermanewt goggles and headphones, and not ever take them off. Why? Because Hebaroo and Islahn and their gang-members, as well as other total strangers on this utterly doomed King Exedo planet, will lure and transfix your insignificant pervious will-power if you put on non-Kristopian or take-off Kristopian goggles and headphones. Don’t be tricked, don’t be stupid! Has HHG-Syn been found and identified? By who or whom? Has HHG-Syn spoken to everyone an easy auditory message? Has HHG-Syn given the same identical written message? On number one above, if HHG-Syn has been found and has been accurately identified, why is there so much disagreement and diversity about the operation and personality of HHG-Syn among Kristopians? On number two, there was/is no singular verbal Code of Gang-conduct (over many centuries of amendments and revisions) in the past or today. Due to the misgivings and conduct/nature of Aurae, no “easy,” no “singular” message can be heard among all Kristopians. Ask any Kristopian to intimately describe Aurae and how Aurae interrelates within Woolly disclosure and Exceptional disclosure, and you find much diversity and controversy aplenty. And finally on number three above, there currently exists between 66-books and 81-books in Kristop’s Code of Gang-Conduct. Kristopians argue those differences are minor, but the simple fact is there’s no single number among ALL Kristopians. By definition of the word canon it implies there exists disingenuous or wrong stories and conduct. In a word, imperfection. In another two words, Unexceptional disclosure. This falls inline with Woolly disclosure quite well. Hence, this does not reflect only ONE way. It does not reflect necessarily two disclosures either. And it does not reflect consensus. It reflects many other things. Monism means that there is only oneness or singleness to a concept, life, or existence. Diversity, differences do not exist. Dualism (or binarism) means that opposed forces exist everywhere in thought, life, or existence. In the gangs of Hebaroo, Islahn, and Kristop, this is typically described as Good v. Evil, Male-Female, Mind v. Body, Physical-Metaphysical, and so on. There is nothing outside of this notion or belief, only black or white, no grey, nothing in between. It’s A or B and done. When one genuinely examines the designs, functions, and endless purposes of all the people, of all the Earth’s organisms and species, and beyond our tiny planet into the endless Cosmos, tell me please, do you find only duplication or bipartisanship, only monism or dualism? If so, show/tell me where and I or another can show/tell you otherwise. Holding stubbornly to monism and/or dualism is like arguing a circle or sphere has corners. Do Not Get Trapped in Tri-Brotherly Tunnel-Vision! Unless you were born into and raised inside the Kristop, Hebaroo, or Islahn gang, asking yourself, their gang-members and gang-leaders how does HHG-Syn speak and how can you determine it’s really the one and only HHG-Syn speaking… is an exercise in Ningbo, Zhejiang, China’s Butterfly Maze to reach the prize. 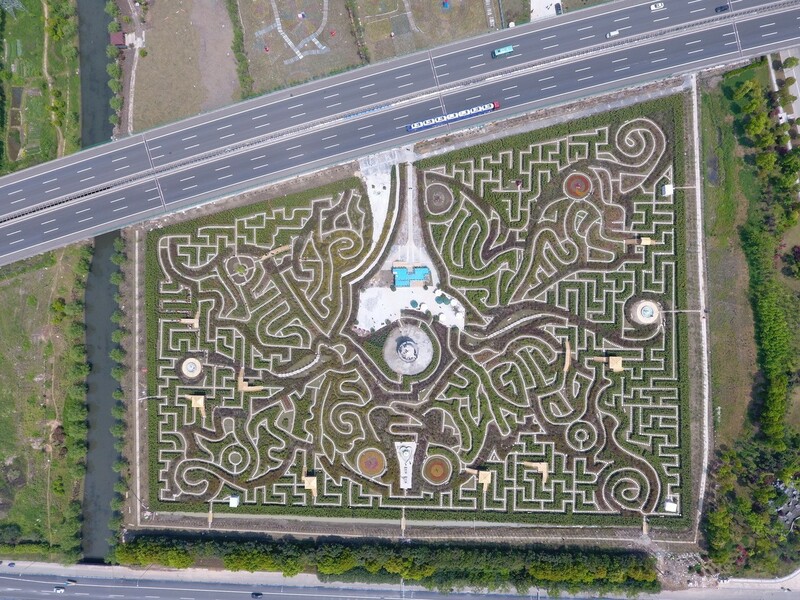 Kristopians do not want anyone starting the maze anywhere outside the 33,565 square meter park, you must start inside the maze only and try to find all exits and dead-ends, never venturing outside the borders. What does that mean exactly? Kristopians and their gang-leaders first make you take an oath, that you accept without hesitation or doubt the reality of King Exedo’s irresistible power and charisma over your brain and body, then pledge your eternal marital allegiance and faithfulness to Kristop — not any other brothers or non-Kristopian gangs — and then finally promise never to stay more than 10-15 minutes in non-Kristopian lands or behaving in non-Kristopian ways. As a result of exemplary allegiance, your basic membership privileges gradually become Gold VIP status and once you pass Go, all fellow members recognize your accomplishments, follow you everywhere, and you collect unimaginable peace, happiness, pleasure, absolute perfection and riches in Caelum as your future promised death-insurance payout! This future promise is null and void if you frequently (or maybe just once or twice) go OUTSIDE the boundaries of the Butterfly Maze. “Frequently” depends on which Kristopian assesses your questionable behavior and what relationship they have with Aurae and Hermanewt. Not so surprising, there is more than one entrance into and exit out of the brother’s masquerades, carousels, carnivals, and mazes. The only way there could be just one entrance/exit is if you repeatedly tell yourself there is just one. In fact, it is possible/probable that thinking strictly one way is a shrewd King Exedo trick. Don’t get caught in the tunnel-vision trap. It doesn’t really exist except in antiquated folklore and fairy tales from an expired bygone time-period in a tiny far away land from a tiny group of nomads wanting to be identified (way back then) as the only true game gang in town. In case you haven’t deciphered the title of this post, it is in Latin, meaning masquerading in the wrong time-period.